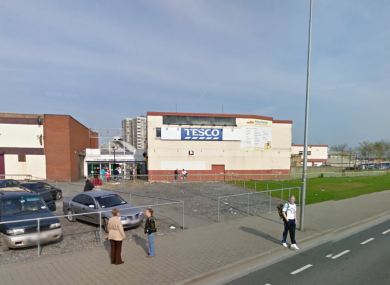 TESCO IRELAND HAS today confirmed that it will close its store in Ballymun, now that it is at the end of its lease extension. The company said the Ballymun Shopping Centre has seen “a significant decline in customer numbers over the last number of years” and that it is now “one of the last remaining retail stores in the centre”. Staff at the store were informed that it will close on 27 April but were reassured that the company will “work with them to find alternative jobs within Tesco”. “Tesco continues to be a significant employer in the area and we will be working with all colleagues to identify alternative opportunities elsewhere within our business,” the company said in a statement. The decision to close the store was taken due to a number of factors – primarily, the store is located in a shopping centre that has been in decline for a number of years – Tesco is currently one of the last remaining retail tenant in the shopping centre and the overall lack of investment in the centre has resulted in a decline in the centre’s popularity with customers. Local Fianna Fáil Councillor Paul McAuliffe said the news “came as a complete shock to employees of the store who received the news today”. “My immediate concern is for those staff members of Tesco who I hope can be redeployed within the existing network of stores, but I am also concerned for workers in neighbouring shops who will now see a massive decrease in footfall,” he said today. The shopping centre is currently owned by NAMA and Dublin City Council. McAuliffe called on both parties to “develop an immediate short term plan which will retain neighborhood shopping facilities and prevent the shopping centre becoming more of an eyesore than it already is”. Email “Tesco to close store at NAMA-owned shopping centre”. Feedback on “Tesco to close store at NAMA-owned shopping centre”.